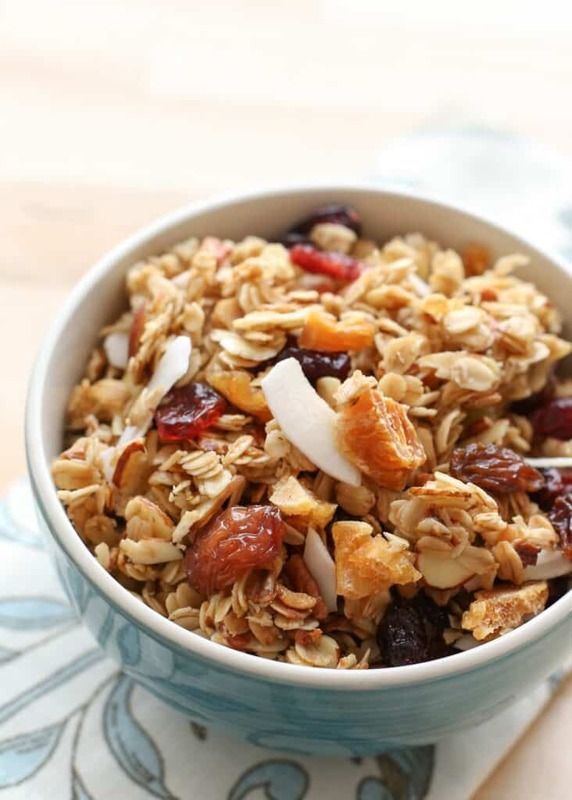 Chewy pieces of dried fruit are tossed with almonds, pecans, coconut and sweetly spiced oats to make this tropical flavored granola. A couple months ago, I made granola in the crockpot for the first time and it was a total game-changer for me. No longer would I need to closely watch the oven and potentially burn the batch when I wanted to make granola. This is almost ridiculously easy and I make a fresh batch at least once a week. Combined with a scoop of homemade yogurt and some chopped fruit, this is the easiest breakfast we eat these days. I play with different flavor combinations almost every time I make granola and this is one of our new favorites. We love all the dried fruits and the crunchy pieces of coconut. * Regular sweetened or unsweetened coconut will work fine in this as well. If you are able to find dried or roasted coconut give it a try. I buy roasted coconut at Trader Joe's and we all love it. Cook on high for 60-90 minutes, stirring and scraping the sides and bottom of the crock-pot every 20-25 minutes. 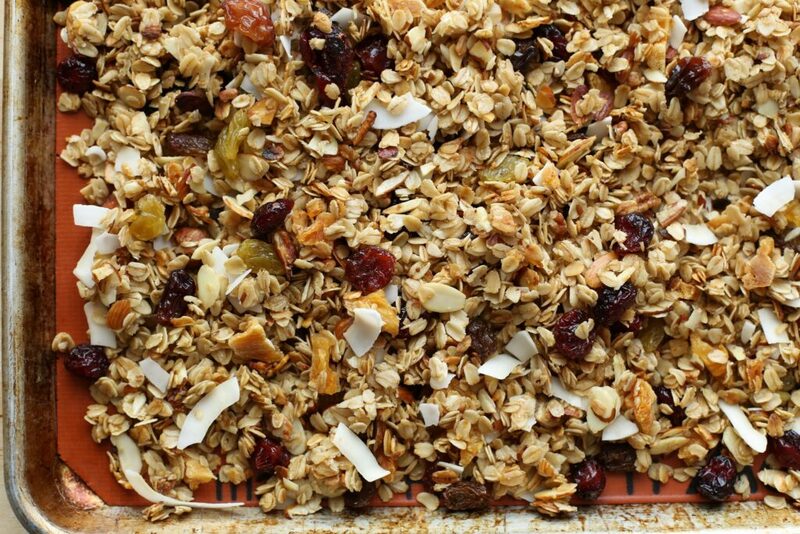 Stir in the coconut and dried fruit and then spread the granola across a large baking sheet. (I like to line the sheet with a silpat mat or parchment, just to make it easier to pick up and pour into a container when it cools.) When the granola has cooled, transfer it to an airtight container. It should keep nicely for at least 2 weeks. Enjoy! The granola cooking time varies depending on how hot your crock-pot gets. One of my crock-pots finishes the oatmeal in about an hour, while another one takes almost two hours. When you begin to smell the granola, it's probably time to stir it again. Use a spatula or large spoon to stir along the edges and the bottom of the crock-pot every 25 minutes. 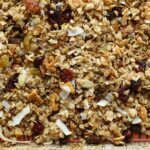 It is possible to burn the granola in the crock-pot if you do not stir it frequently enough or if you do not scrape the sides and bottom each time you stir it. The granola is done when the liquids have been absorbed and the oats look moist, but not wet. It will finish drying out and clump together a bit while it cools on the baking tray. Mary, this is perfect and my most favorite flavors. I can't wait to try this method. Perfect! Love all the ingredients and in the crock pot is a bonus! What a great flavor combination. Wow! and you made this in the crock pot, how clever! Did you mean to write oats, almonds and pecans in the first ingredient combo, rather than raisins, almonds & pecans? Yes! Thanks for the catch. I've updated the recipe now. Love these ingredients. I've never made granola in a slow cooker, but I will now! I use the base granola with coconut oil, honey and salt...then I go crazy with whatever I want in it. It makes enough for me for at least a week plus plenty for sharing! My favorite so far has been with maca and cinnamon. I put it on the first stir along with dried mango, gojis and diced figs. At the end I put in the flax seeds. I use this as my base recipe for granola, which I had never made before. I get a little crazy with cinnamon, maca, dried mango, dried figs, dried ginger and gogjis. It makes enough for me for about a week with plenty to share, and everyone cant get enough! Thanks for sharing this recipe. I have a batch going right now and the smell is great. It is getting way too hot to turn my oven on now. Mine obviously will be somewhat modified since this is a great opportunity to use up some of the dried fruit and nuts that I have around the house.